Fritz Neumeyer, the son of a forester, was born in Egloffstein Germany in 1875. He completed his education at a trade school in Nuremberg and in 1890 he began an apprenticeship with Armaturenfabrik Amag Hilpert, a fittings manufacturer in Nürnberg. By 1894 he had been promoted to representative of the Zurich branch which he chaired for two years. Neumeyer was eager to begin his own business, and in 1897 he founded a company for construction of water treatment plants in Zurich. In October 1903 he registered “Fritz Neumeyer, Nuremberg” and purchased the Köllisch game and hardware factory, initially producing classic products such as toy steam engines and trains. After meeting Dr. Fritz Singer who had developed a process to produce seamless brass tubing, the factory was redesigned and began manufacture of tubing for car and aircraft radiators as well as ballast containers for airships. By September 1917 the Köllisch facilities had reached capacity and production was moved to a new plant on Lobsingerstraße in the Herrnhütte district of Nürnberg, where they were joined by Friedrich Krupp AG and the Gebr Thiel company to produce artillery fuses for the defense industry under the name “Zünder und Apparatebau G.m.b.H.” (Zünd-app). 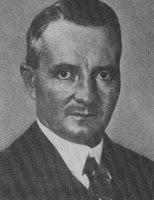 After the 1918 armistice ended World War I and military contracts ceased Neumeyer became the sole proprietor of the company. 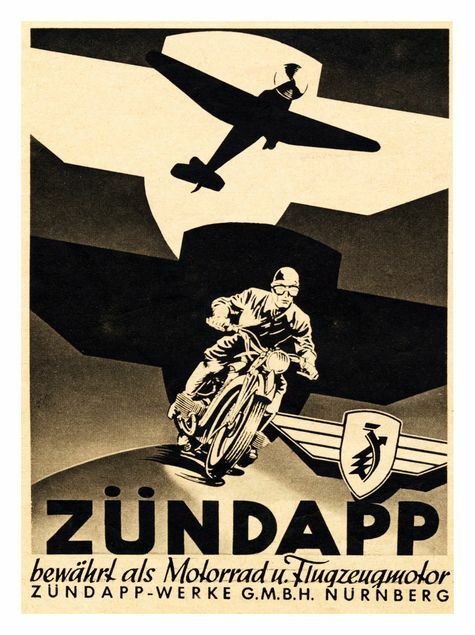 Through the early 1920’s he made various manufacturing ventures ranging from metal cable to hydropower turbines; the Zündapp factory itself was turning out a variety of products including typewriters, nuts and bolts and vehicle alternators. The first 1921 Zündapp model was the Z22 and was touted as the “motorcycle for everyone” (Motorrades für jedermann). The machine was powered by a half horsepower 211cc two-stroke engine using belt drive, and it was designed with a focus on ease of use and handling. At first production was spread over four sites, but in 1924 the factories were converted to American style assembly line production and by the end of that year 10,000 units had been sold. 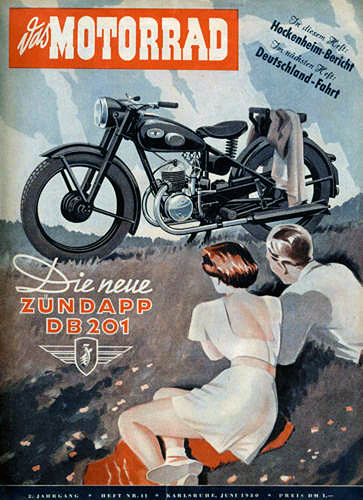 In 1927 company director William Wittig rode the 25,000th Zündapp machine off the line, and in 1929 75,000 motorcycles had been produced. In 1928 architects John and Karl Kröck were commissioned with the construction of a new factory and the resulting concrete structure was heralded as “the most modern motorcycle factory in the world.” Despite an encroaching global economic crisis Neumeyer continued to invest and upgrade its machinery as his son, Hans-Friedrich, took over management: in 1930 the first four stroke model was brought out, powered by a British Rudge Python engine. At the 1933 Berlin International Automobile and Motorcycle Exhibition Zündapp presented eight new machines with engines ranging from 200 to 800cc. The new K series (K standing for Kardan or shaft drive) was designed by Richard and Xaver Kuchen, and consisted of both two stroke and four stroke models characterized by pressed steel rigid frames and girder forks with the fuel tank being housed within the upper frame rails. 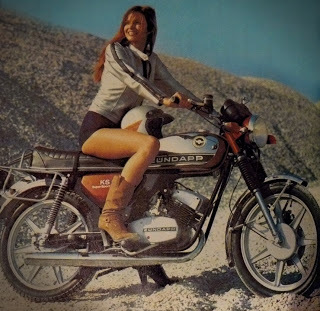 The smallest model in the range was 198cc two-stroke single and the largest was a 797cc side valve flat four (K800); in the middle were a pair of 500cc flat twins, offering a choice of side or over head valves housed in a block similar to the 797cc four. 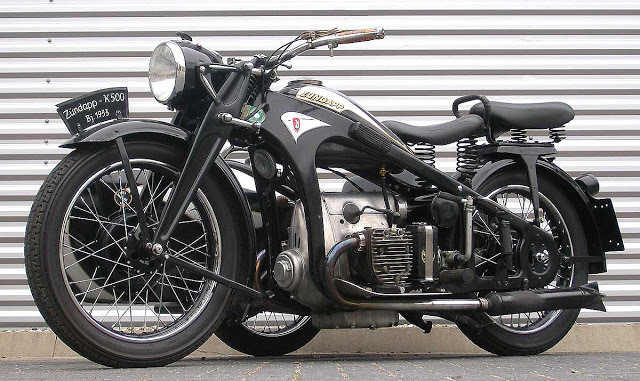 The K500 transverse twin and K-800 transverse four were very successful: more than 15,000 K500s were built between 1933 and 1939. In 1935 Zündapp employee Adolf Liebergeld invented a new process for cold extrusion of hollow steel which further enhanced production. In 1935 Zündapp also developed a quadricycle delivery car also designed by the Küchens. The company had tried several times to break into automobile manufacture: as early as 1924 they had talked to the British company Rover about a small car license but the negotiations collapsed. A renewed attempt followed in 1931 to develop a small four passenger car, the Porsche/Zündapp Type 12, and the name “Volkswagen” appeared for the first time. But after only three prototypes the project was abandoned: problems had developed in the engine cooling and transmission during trials and Fritz Neumeyer subsequently decided not to proceed with the development. All three prototypes were lost during the war, the last in 1945 in Stuttgart during a bombing raid. A Zündapp automobile was finally released after the Second World War, but it was not well received. Dr Fritz Neumeyer died on 10 September, 1935. Throughout the 1930s Zündapp had delivered many K models to the Reichswehr but these were basically just enhanced civilian machines. 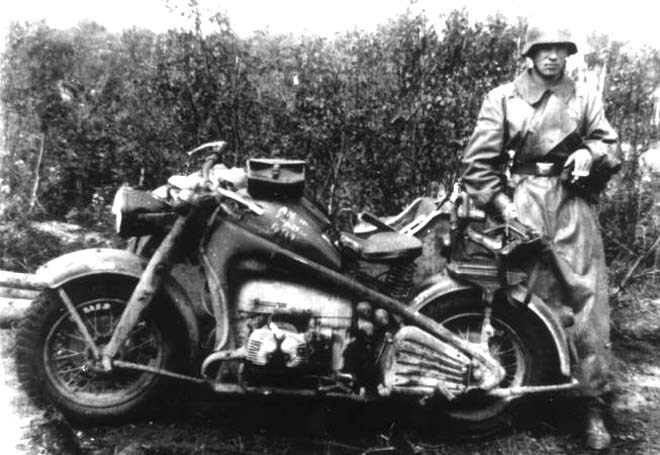 At the end of 1937 the army arms unit in Berlin demanded a bike that would carry a payload of 500kg which corresponded to three soldiers with arms, ammunition and full equipment; fully loaded it needed to be able to maintain a permanent speed of 80kph on the autobahn, possess a top speed of 95kph and, to accompany marching troops, be capable of maintaining a minimum of 4kph. Cross-country 4.5 x 16 tires had to be be used (interchangeable with those on VW’s Kubelwagen), minimum ground clearance had to be 150mm and the mudguards needed sufficient clearance to allow for the fitment of snow chains. 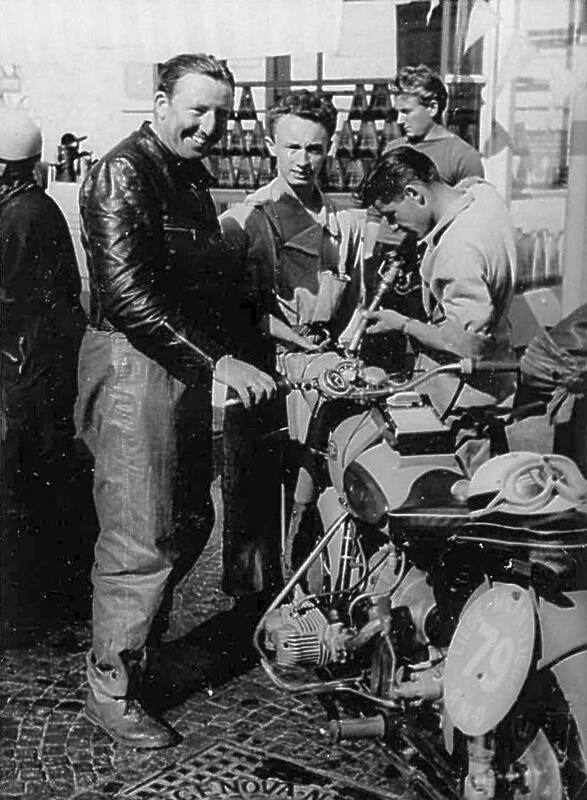 By 1939 Zündapp had built two 700cc prototypes that went to the OKH for testing. 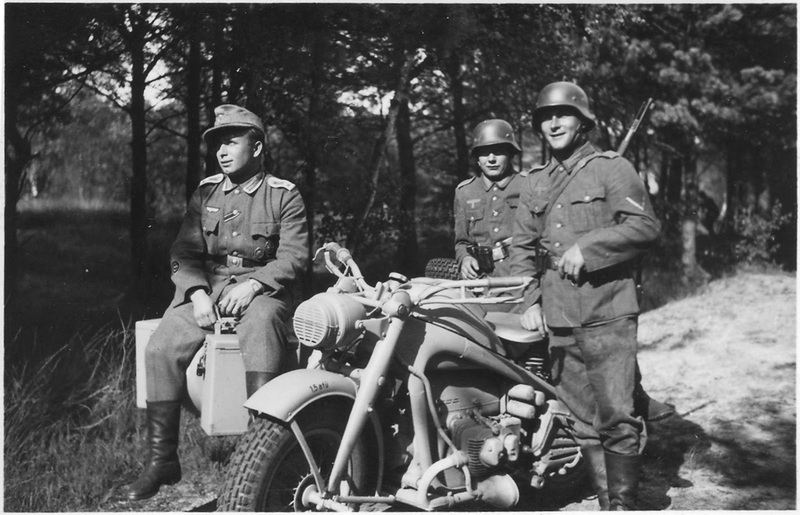 BMW had also been asked to develop a similar bike but after testing both the Zündapp KS750 and the BMW R75, the KS was found to be superior. BMW were asked if they would build the KS under license but they refused, although they did later adopt the two-wheel drive and hydraulic brake system. 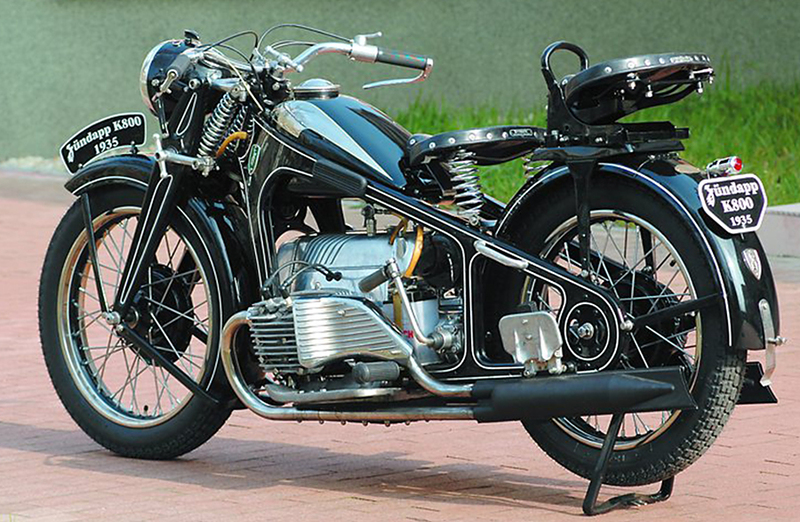 In August 1942 Zündapp and BMW, on the urging of the Army, agreed upon standardization of parts for both machines, with a view of eventually creating a Zündapp-BMW hybrid, in which a 286/1 side-car would be grafted onto a Zündapp KS 750 motorcycle. 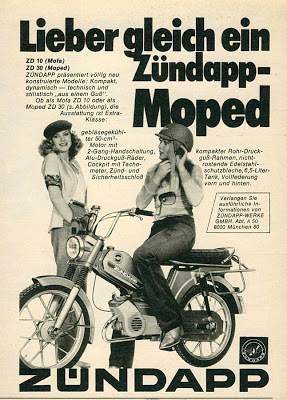 They also agreed that the manufacture of the R75 would cease once production reached 20,200 units, and after that point BMW and Zündapp would only produce the Zündapp-BMW machine, manufacturing 20,000 each year. In the following years, the company experienced a steady upswing. 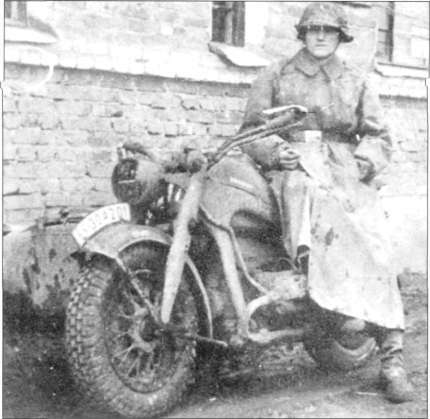 Beginning in 1940 the company had change over to armament manufacture and was now producing motorcycles and small tanks for the Wehrmacht; Zündapp produced more than 18,000 units of the Zündapp KS750, mostly as a sidecar outfit. But by 1944 the factory had been bombed into rubble and over two thirds of the machinery was lost. 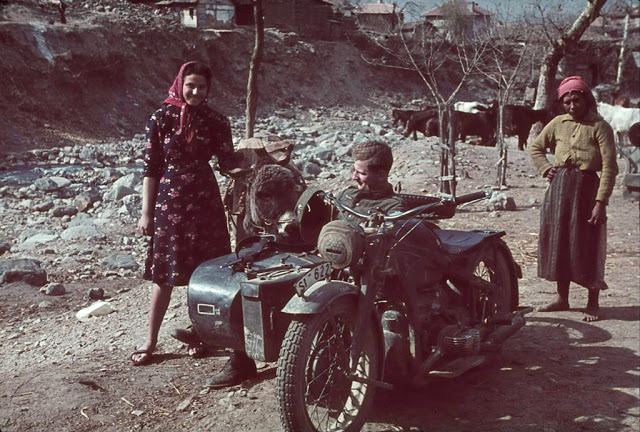 A further 98 units were assembled by the Soviets in 1946 as reparations, and In 1954 a small number of modified R75’s was produced at Eisenach (then in Soviet-controlled East Germany) for testing under the designation AWO 700, but were never put into full production. After the war motorcycle production was initially banned, and the remains of the company consolidated to manufacture grain milling equipment. Because new clothing remained in short supply a large home based industry quickly sprang up to repair and alter secondhand clothes, creating a high demand for both household and professional sewing machines. The Zündapp factories were still in the process of rebuilding but they quickly converted their remaining equipment to sewing machine manufacture. 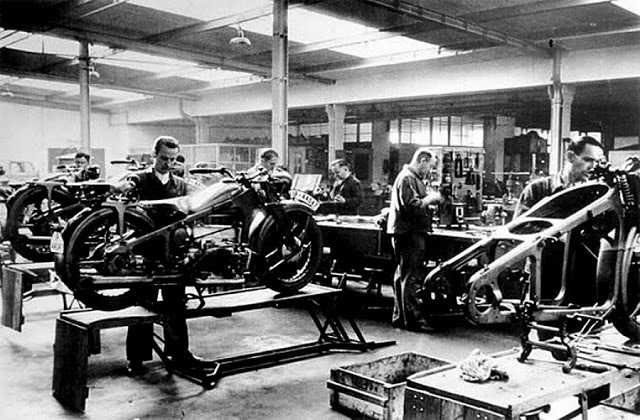 Motorcycle production lines finally started up again in 1947 and in 1950 a branch factory was established in Munich employing some 1,700 people. 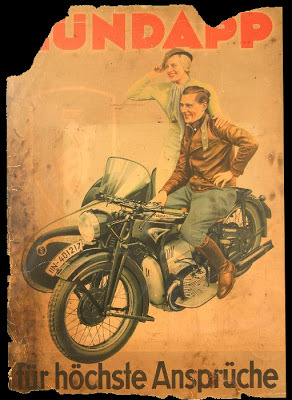 Their first new production bike was the DB201, based on the “Derby” series DB200 (also known as the “bauer motorrad” or “farmer’s motorcycle”) that had been one of their more popular machines from 1935 – 1940. The DB201 was built to pre-war specs but almost immediately upgraded as finances permitted: a 7hp 198cc, 3 speed chain drive provided up to 85 kph. 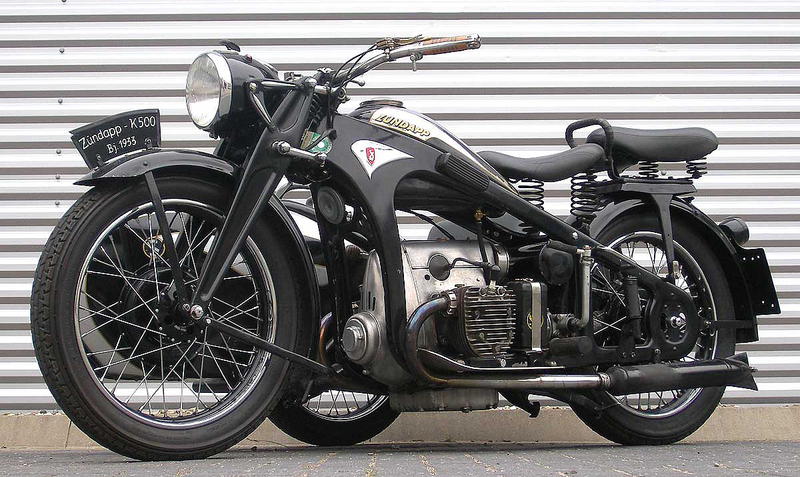 In 1951 Zündapp developed the KS601, their first “heavy” motorcycle since the war. The newly designed 597cc boxer motor with dual Bing carburetors produced 28 Hp at 4700 rpm with peak torque of 33.6 Ft. Lbs at 4000 Rpm: this was more powerful than the Volkswagen, and it made the KS-601 an immediate hit with enthusiasts. It also sported telescopic forks (as opposed to the traditional Zündapp parallel four link forks) and plunger rear suspension. The fenders, tool box, fuel tank, fork cover and head light housing were painted green, partially to distinguish it from BMW, and it soon earned the well known title of “Green Elephant”. The bike received enthusiastic reviews from various motoring magazines, and initially proved popular with both the motor sports crowd and average owners who quickly came to appreciate its rugged dependability. In 1954, a father and son team rode a Zündapp KS601 on a highly publicized 20,000 mile trip around the world after which the bike was dismantled by a group of motorcycle journalists and factory technicians. 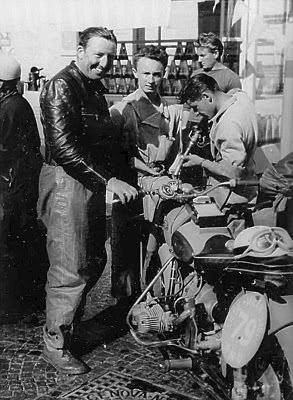 They reported that the machine showed little wear after the journey, and were awed by its durability in conditions they felt would have destroyed many of the bikes offered by Zündapp’s competitors. But despite positive press, KS601 sales were lagging considerably behind similar models from BMW. Zündapp adopted several strategies to try and boost interest, introducing a Sport model with 34hp instead of the standard 28 and additional color choices. 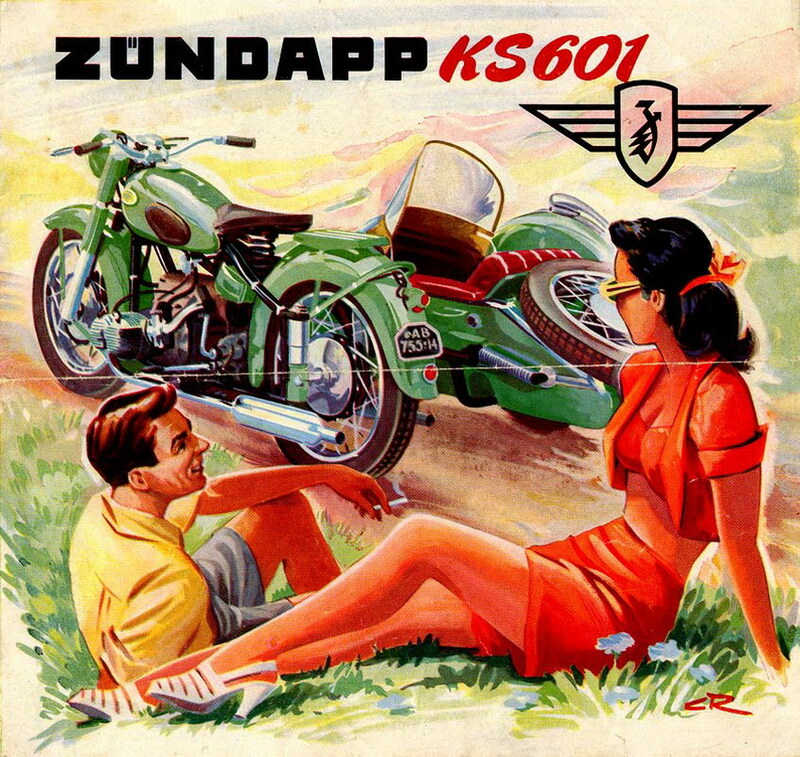 In a final attempt to bolster sales the Zündapp KS601 Elastic was introduced in 1957, featuring the Sport engine and a new swing arm rear suspension. Aimed exclusively at the US market it was still too little too late; Zündapps were widely viewed as heavy duty sidecar machines, and despite handling that was superior to comparable BMW’s they just couldn’t shake that reputation with solo riders. Also, the world economy was picking up and more people could afford to purchase cars which had obvious advantages over motorcycles for practical day to day transportation. 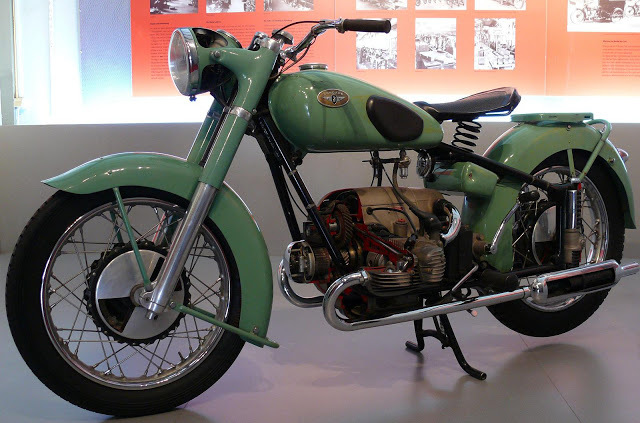 Production of the KS601 in all its flavors from 1955 to 1958 failed to reach 1000 motorcycles: total production across all the years of its manufacturer barely topped 5000. 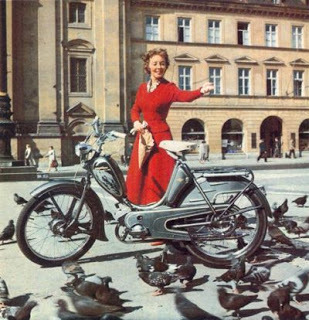 In 1958 Zundapp sold the Nuremberg factory to Bosch and production of the Zundapp KS601 ceased. Still, the “Green Elephants” were able to impress an admiring public with their remarkable ruggedness and reliability, and devoted Zündapp KS601 owners have formed organizations all over Europe. 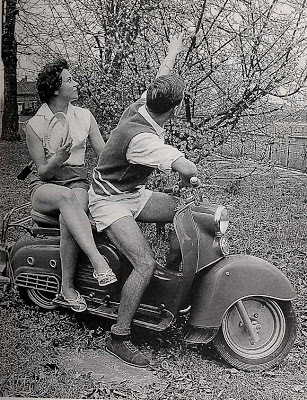 About the same time as they began development of the KS601, Zündapp decided to take a look at the scooter craze sweeping Italy. 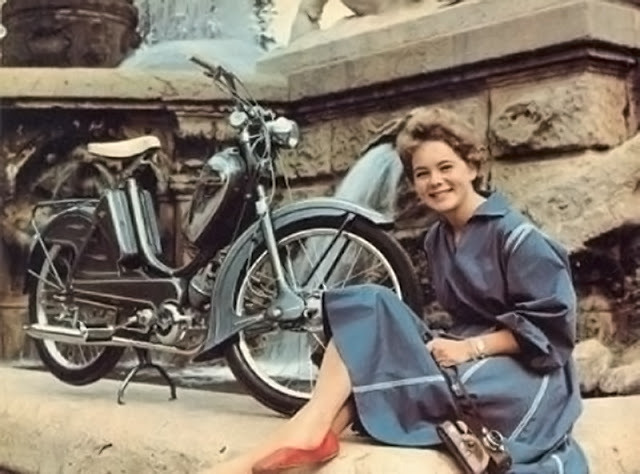 After testing various prototypes based on some of the more popular Italian designs, Zündapp introduced the R150 “Bella” scooter in 1953. Powered by an air cooled 146cc two-stroke single, featuring 6v electrics with a kick starter and an undamped telescopic fork. The fuel tank was mounted under the seat. 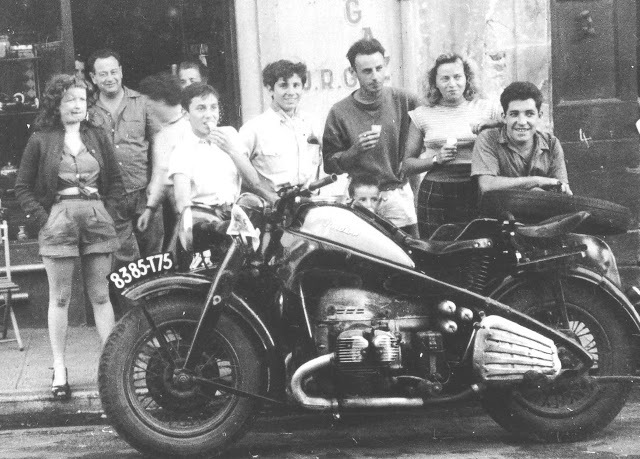 Characterized by a very large front fender with a slim rear end and a tubular motorcycle-like frame, the design of the Bella was heavily influenced by that of the Italian Parilla Levriere (Parilla Greyhound). In 1955 an electric start version of the 200cc model was released along with a special USA-only model called the Suburbanette. Substantially changed for the American market, the Suburbanette wasn’t nearly as popular as the original model and only 370 were sold. 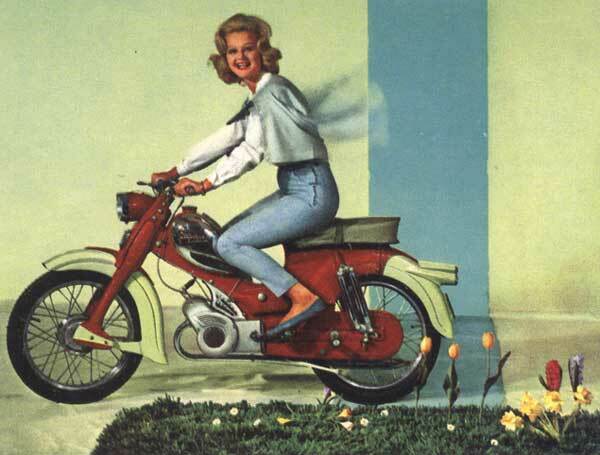 The R201, which arrived later in 1955, had more curvy styling than the original R200 and a new carburetor. 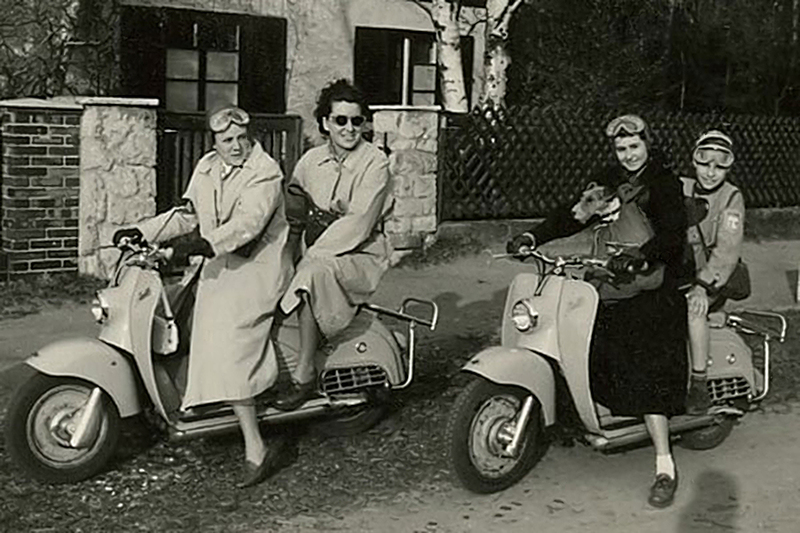 Also a Steib sidecar made was available as a dealer option- the sturdy frame made it an ideal platform for a sidecar. In 1956 Zündapp released the R153 and R203, followed by the R154 and R204 in 1957, each having a slightly larger engine than the previous year. The last 150cc Bella was manufactured in 1958, but the 200’s were continued until 1962; a 175cc model, the R175S, was introduced in 1961 and continued through 1964. But by 1955 the looming crisis in the European motorcycle industry was already on the horizon. Realizing that compact cars were in much higher demand than motorcycles Zündapp made a last attempt to break into the market; the company settled for a micro-car designed by Dornier Flugzeugwerke that featured both a forward-opening door for the front seat and a rear-opening door for the rear-facing passenger seat; this “coming or going” design was given the name of the two faced Roman god Janus. 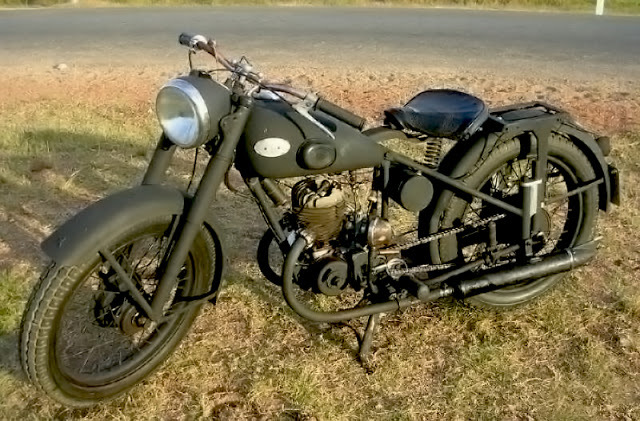 The Janus was powered by a mid-mounted 2-stroke single cylinder 245cc engine developing 14 hp (10 kW), enabling a top speed of 80 km/h. The problem with the mid-engine configuration (which usually leads to optimal handling) was that the engine was lighter than the rear passengers, and that lead to a variable center of gravity. Production started in June 1957 but only 1,731 cars were sold in the first six months. By mid-1958 Zündapp abandoned the project and sold the factory to Bosch after producing only 6,902 cars. After the failure of the Janus project drastic measures were taken to try and rescue the ailing company; the motorcycle, car and sewing machine production facilities in Nuremberg were abandoned in 1959 and the company headquarters was moved to Munich. The workforce was reduced by half, but the decline could not be stopped. 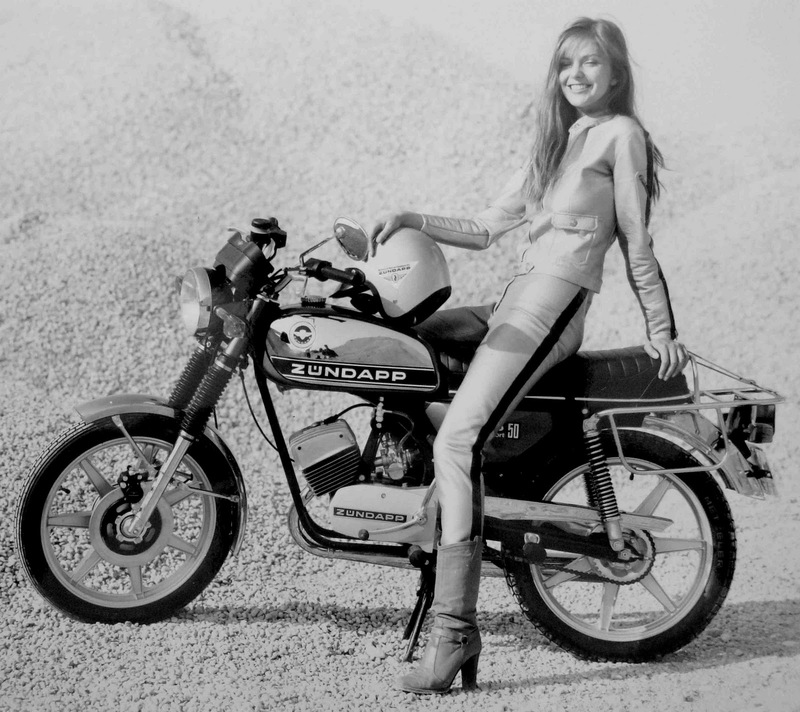 For the next decade production was focused on mopeds and light motorcycles. Germany and Austria had a specific “moped” motorcycle classification (category IV), limited to a 50cc maximum engine capacity. 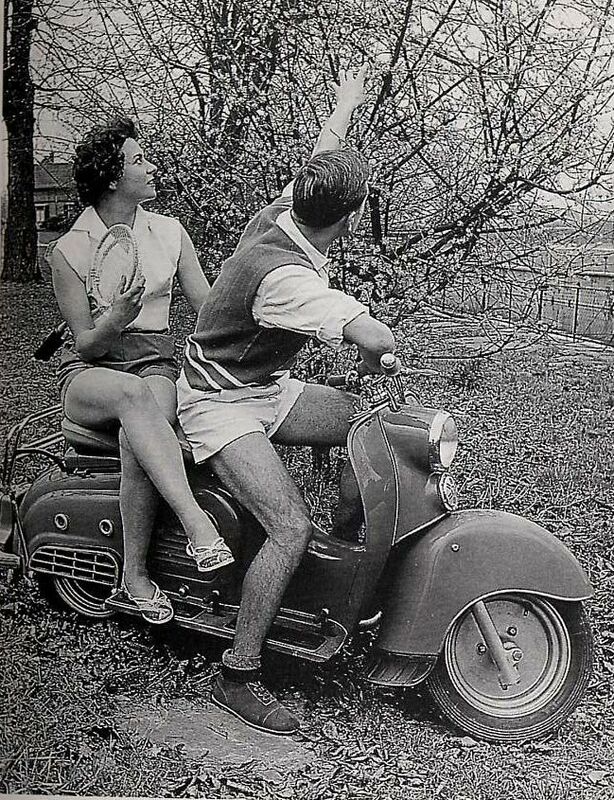 Moped licenses were easily acquired by 16-year-olds with no other driving permits, but the market had been largely ignored as mopeds had also been required by law to weigh less than 33kg. 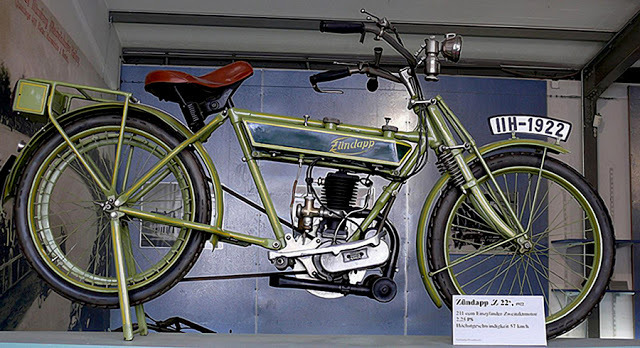 In 1953 Zündapp had released the Combimot KM48, an auxiliary engine for bicycles, and when the weight restriction was removed in 1955 the company rushed to take advantage of an expanding market. The KM48 was mounted in a tube steel frame, fitted with pedals and a chain drive and became the Combinette. 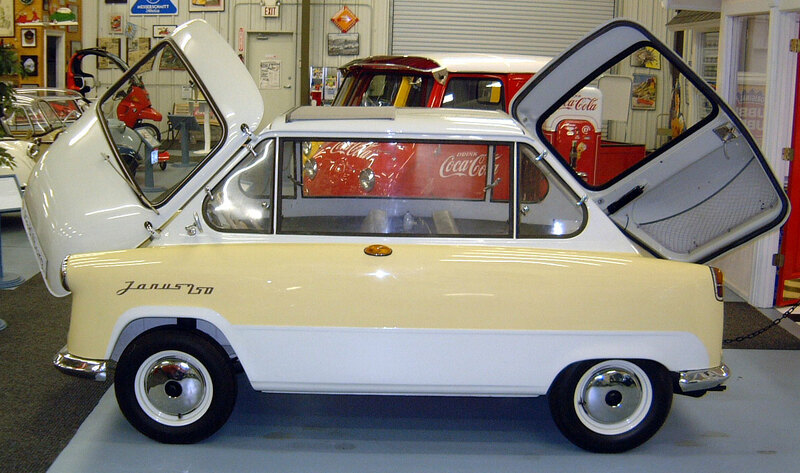 By 1962 this had evolved into the KS50; featuring a three-speed gearbox, all-wheel suspension and a central tube frame with the rear portion die-cast in aluminum, this heralded a new era for Zündapp and the chassis design would remain standard until 1984. In 1970 hp was increased to 6.25, the brakes were upgraded and the gears increased from three to five. 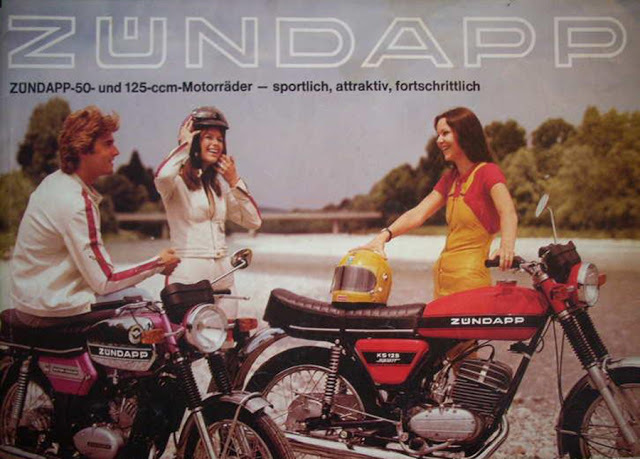 By 1967 the German market share of Zündapp motorcycles was down to 33%. Even though the factory had diversified into other products such as boat engines, sewing machines and lawn mowers they were unable to compete against low cost, high volume imports – especially from Asia. Additionally, their focus on two-stroke machines and outdated designs couldn’t compete with the modern designs coming from their competition. Large capacity Japanese four-stroke motorcycles were not as robust, but they were what the buying public wanted. The Zündapp GmbH filed bankruptcy in August 1984 and the production was sold for DM 16 million to Xunda Motorcycle Co. in Tiajin China; Xunda continued to produce small motorcycles under the Zündapp name from 1987 until the early 1990s. 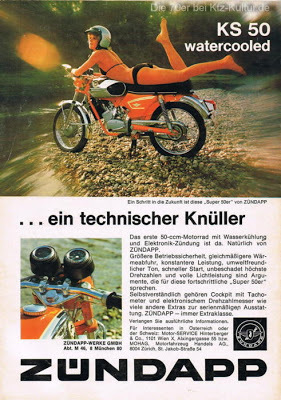 In Portugal the FAMAL and Casal companies produced Zündapp engines under license: Casal marketed their Solo and Mars 50cc mopeds in Germany through mail order houses. Today the Chinese Zündapp company is still in business, producing Honda based 4-stroke motorcycles and electric mopeds.